You may have heard about Google Panda and Penguin updates and penalties, but what do they really mean and why should you care? Panda and Penguin are both filters and penalties in the Google algorithms that adversely affect the rankings of what Google considers to be low-quality websites. Panda is mostly about low-quality content on a website. Penguin is mostly about webspam, especially low-quality links pointing to a website (a.k.a. inbound links or backlinks). Some sites suffer from downgrading for both practices. These algorithms are often refreshed (re-run), and updated (changed and re-run). Google also gives each refresh a version number, to make each update easier to identify. It is helpful for people who work in Search Engine Optimization (SEO) to know about specific updates: for example, the Penguin 2.0 update, which took place in May 2013. The criteria Google uses to make determinations of quality is not a mystery. Google has been telling us for a long time what it expects to see in a good-quality website, including not only the type of content, but the kind of links which direct users to good-quality pages. The Panda updates target low-quality content. Duplicate or near duplicate content: This includes articles that have been distributed to multiple sites across the web. Changing a few words or sentences or rearranging their order is not enough for content to be considered unique. Not enough content: Pages with insufficient content are not considered meaningful, and therefore are not much use to readers. Keyword-stuffed content: We all feel the pain when we try to read this stuff. It was obviously written for the Search Engines and not for humans. Irrelevant content: Content on a page that is off-topic and not related to the rest of the website. Content that’s not useful: Content that Google cannot decipher is not considered to be useful enough to humans to appear in search results. Content shared with other websites is considered not useful. Pages that are just lists of links are not useful. Pages full of images or videos with little or no explanatory text are considered not useful. In the past, this type of web content only hurt the rankings of the individual pages where it was published. Now, it negatively affects the rankings of the entire website on which it appears. The more low-quality content a site has, the more it is likely to be demoted in the rankings. The Penguin updates target webspam. The target of Penguin is webspam, which is indicated by unnatural or unearned incoming links, and keyword-stuffed internal links which direct traffic from one pages to other pages on the same website. All or most links go to home page: Google contends that if a site is full of quality content, it will attract links to different pages and not just to the home page. Off-topic links: Links from forums, blogs and websites that are unrelated to what you do, do not help your pages rank. If a link doesn’t make sense to humans, it doesn’t make sense to Google, either. Good links come from pages that are about your industry and/or your location, or are from other websites in your location or industry. Too many links from other sites you own or control. Sitewide links: These are links from all the pages on a site, and are usually found in the page footers or sidebars. Too many exact match links: These are links with text that exactly matches the term(s) for which you wish to rank. This can hurt you if it appears on your site, as well as on other sites. Too many links of the same type: such as forum links, article links or blog comment links. Linking out to off-topic pages and low-quality websites rather than to good ones that naturally segue from your pages. The surest sign of a link-related penalty from Google is a written warning from Google via your Webmaster Tools account. The warning will state there are unnatural links pointing to it, although websites that receive these are often egregious offenders. However, having even one link from a site that is being targeted by Google might be enough to get a formal notice. These notices are sent out after a human review of a site’s links. In order to get this penalty lifted, all the bad links need to be removed, and you must file for reconsideration. Most business owners should avoid trying to sort this out themselves. If you’ve received a warning from Google in Webmaster Tools, get professional help fast. If you’ve been hit by Panda, there’s no point in pussyfooting around: Google thinks your entire site is of low quality. Unless you take drastic steps to improve it, your website will sink further in the rankings as additional updates and refreshes appear. First, evaluate all of your pages for quality and usefulness. If you think they are good quality pages, you may need more objective eyes to take a look. Then, make sites more useful to readers by eliminating pages with little value, and combining shorter pages about similar topics. Remove any content that is not unique to your website, and avoid presenting the same content on more than one of your URLs. Create new, more useful content and promote it on social media, so that it attracts viewers (and tweets, shares or +1s). Make sure you are not overusing keywords in either your text content or in the links pointing from one of your pages to another. Although you may have not received a notice from Google, you may not have escaped the consequences of a manipulative-looking link profile. The websites that Penguin demotes do not receive these warnings: they simply become adversely affected by the algorithm. No reconsideration request is needed to recover from an algorithmic Penguin hit. If it looks like you suffered from a Penguin update, a thorough examination of the website’s backlink profile is in order. Obviously, bad and iffy links should be removed in a process known as link pruning. At the same time, good-quality links need to be gained to get the backlink profile back on track towards a good balance. Before the site will regain its rankings, Google will need to re-crawl your site, find and index your new, good links, and prove that the bad links have disappeared. It’s fairly simple to tell if you’ve taken a hit from either Penguin or Panda by using the Panquin Tool. It’s free, easy-to-use software that overlays known Google quality updates on your traffic as recorded by Google Analytics. You need to have Google Analytics installed on your website and you must give the tool access to your account. You may find little to salvage on a site that has been badly damaged by either or both of these penalties, and decide to start over completely. When this is the case, take a long, hard look at your online goals and design your new site to support those goals and to be valuable to searchers. Then, you must not do anything where the primary purpose is to manipulate the Search Engines. This is the best way to Panda-proof and Penguin-proof your site for the future. If you find that your site has taken a few hits and not recovered, you may want to find expert help. Sixth Man Marketing is dedicated to helping to make your website work better for you. Please call us if you need assistance! 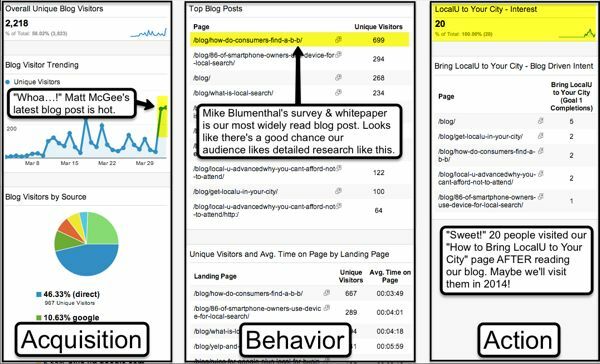 My purpose for this post is to provide supporting analytics information, my analytics introduction presentation, and tips so that business owners can use their web data to help grow their business. Analytics takes a bit of time to grasp but is worth the effort. Here’s some information to get started. If you have the time (and it does take a while) I recommend going through Google’s Conversion University to learn all about Google Analytics. That said, they’re a bit on the dry side (understatement) and take a while to get through. However, this great Google Analytics installation video from Ian Lurie of Portent Interactive gets you started in just over ten minutes. Here are my most recent analytics presentation. Please feel free to download or share. One of the things I really emphasize when I present is the importance of understanding what’s important to YOUR business. Don’t worry about all of the metrics, pay attention to the ones that impact YOUR business. For example, my wife Tine is the Executive Director of a nonprofit called Bloom Spokane. Their #1 business driver is the number of people that attend their in-person classes. So we measure that as a KPI. 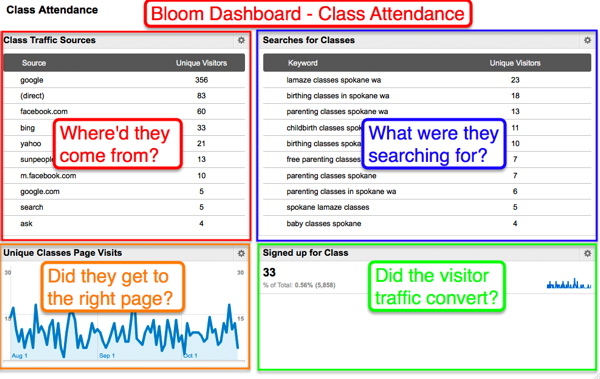 Here’s how we look at it in a custom dashboard. 1) Understand what’s important to measure when it comes to YOUR business. Every business is unique. Learn what’s important to measure, learn from your insights as well as mistakes and make improvements. 2) Get your hands dirty and learn this stuff! It’s powerful, people! I know you’re busy, but your business will benefit greatly from this information once you take the time to learn it a bit. 3) Take action! You don’t need to be an analytics ninja to take advantage of this stuff. You can make improvements to your website today by just taking a few suggestions from the information in this blog post not to mention the mountain of valuable information from my Get Listed friends. I wish I was in Western New York with all of you today! I know you’re getting a TON of valuable information from the Get Listed crew. Be sure to take full advantage of it!